Above we have the present day church as described in the article below. This and other photographs can be seen on the church’s own website. Click here to read more. Below on the right we have a rather poor quality photograph of the Roman Catholic Chapel that was once at 13 St Mary Street. Click here to read more. 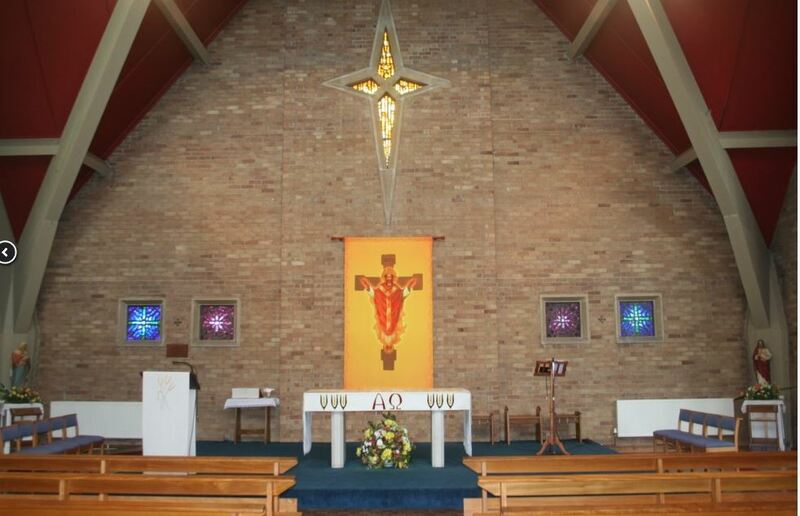 ‘The decade of the 1960s proved a period of great rejoicing for the Roman Catholics of Thornbury and district as the growing strength of their cause was made manifest, first by the erection of a new church and then, a few years later, by a new school in Thornbury. The new Church of Christ the King is tucked away unobtrusively behind and adjacent to Porch House, Castle Street, Thornbury and Porch House itself now contains the successful Social Club run in connection with the new church. The church was designed so that while it is basically modern in character it does not contrast too greatly with the very attractive character of Thornbury. The church was designed as the first part of what, it is hoped, will be a larger church and for this reason not only has it a temporary asbestos side but it is also somewhat higher than the present size of the church would require so that when it is enlarged the height will be proportional to that of the larger church. As built, the nave of the church is exactly square and has no internal columns so that the altar can be seen by all. Most of the light for the interior of the nave is from a large triangular window over the porch which faces Castle Street. This window is glazed in hollow glass blocks which diffuse the light and which let in less cold than normal glass. The triangular glass block window is split up by reconstructed stone mullions, the central feature of which is a cross which is intended to express that of the cross after Christ has been taken down and his Crowning as King is expressed by a gilded crown at the apex of the triangular window. The remainder of the artificial stone slightly echoes the cross theme. At the side of the entrance porch is a semi-circular baptistry lit by a circular plastic top light and symbolically approached down three steps. The font is probably a 19th century one bought by the Order from Germany. The present sanctuary, which is opposite the entrance porch, will form a Lady Chapel when the church is extended. It is lit by tall windows with deep reconstructed stone mullions which cut off the direct light from the congregation but which light the Portland Stone altar and the mosaic of Our Lady and Child on the wall over the altar. The mosaic is constructed of about 4,000 Italian glass mosaics, some of them gold. The altar rails are unusual as they are constructed of special toughened glass with only the top rail of oak. The structural frame of the church is in reinforced concrete supporting the steep tiled roof and the exterior and interior walls are of facing bricks. Inside, the floor is a wood block under the seatings and vinyl tile in the aisles. At night the whole of the nave is lit by a specially made 15ft diameter chandelier. The heating is by means of infra red electrical overhead heaters. The cost was originally in the neighbourhood of £15,500 but a number of additions raised it to between £18,000-£20,000. The church was designed by R. E. E. Beswick, F.R.I.B.A., of Messrs. R. J. Beswick & Son, Swindon, who also designed and executed the mosaic over the altar. The general contractors were Messrs. C. H. Pearce & Sons of Westbury-on-Trym. The church will hold about 260 people in its present form but when needed it can be extended to accommodate up to 500 people. Father Bernard Ruddy, Priest at Thornbury at the time, said that the church would cater for the population within roughly a six mile radius of Thornbury including Aust, Almondsbury, Leyhill, Stone, Latteridge, Falfield and as far as Northwick. 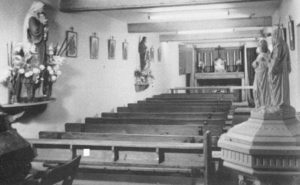 The new Church was blessed and opened for worship on Monday, March 16th, 1964. The ceremony began outside the church with the saying of prayers and the singing of litanies. While the litanies were being sung the Rev. Monsignor Thomas J. Hughes, Vicar General of the Diocese of Clifton, went inside and sprinkled the various parts of the church with holy water. He then returned to the outside of the church and spoke the prayers of blessing. The blessing of the church was followed by a mass and the Very Rev. Anthony Ingram, Provincial Superior of the Salvatorian Fathers, Brakespeare College, Abbots Langley, Herts. gave an address. The choir was formed of about two dozen visiting priests. There was a very large congregation present. The visitors present included the Rt. Rev. Monsignor Joseph Sutton, Parish Priest of Majella, Bristol; the Very Rev. Canon Francis P. Rynn; the Very Rev. Anselm Slattery, Superior of the Brakespeare College; the Very Rev. Aloysius McDonagh, Superior of St. Joseph’s College, Harrow Weald, Middlesex; the Very Rev. Alban Anderton, St. Mary’s College, Radford, Oxfordshire; the Rev. Father Bernard Ruddy of Thornbury; the Rev. Father O’Regan of the Church of Our Lady, Lawrence Weston; the Rev. Richard Norris, Holy Cross Church, Bedminster, Bristol; the Rev. Bartholomew Collins, St. Joseph’s Church, Fishponds, Bristol; the Rev. Dennis Lucy, St. Teresa’s Church, Filton; the Rev. Louis Farrell, St. John Fisher Church, Frenchay; the Rev. Nicholas McCarthy, St. Dominic’s Church, Dursley; the Rev. P. McGovern, St. Lawrence Church, Chipping Sodbury; the Rev. William O’Callaghan, the Bishop’s Secretary, St. Ambrose, Leigh Woods, Bristol; the Rev. Alphonsus Hopwood, St. Joseph’s Church, Harrow Weald; the Rev. Philip McCabe, St. Xavier’s College, Abbots Langley; the Rev. J. G. McReynolds of Bridgwater; the Rev. Hilary Clark, St. Mary’s College, Radford; the Rev. P. Burns, St. Josephs Church, Harrow Weald; the Rev. Brother Alphonsus Hughes, Harrow Weald; the Rev. Clement Mercer, St. Mary’s College, Berkshire; the Rev. Joseph Hogan, Chaplain at Oldbury Nuclear Power Station; the Rev. Cyril Field, Thornbury; the Rev. Richard Dunn, Thornbury; Mr. R. Beswich, the architect and Mr. Cripps representing the builder, Messrs. C. H. Pearce & Sons. It was only just over four years later – in May, 1968 – when a start was made on the erection of the first Roman Catholic primary school at Oakleaze Road, Thornbury. Father Clement Mercer, Parish Priest of the Roman Catholic Church of Christ the King, Thornbury was surrounded by children as he cut the first sod, following brief prayers. Among others present were Father Edmund Lanning, Assistant Priest, Mr. and Mrs. H. E. G. Wells, Mr. S. F. Hodsman and Mr. K. Cooney, School Managers, a number of parents and representatives of the contractors (William Cowlin & Son. Ltd. of Bristol) and architects (Ivor Day & O’Brien of Bristol). After Father Clement had dug the first turfs he handed the new spade to some of the children to dig also. The blessing and official opening of Christ the King Roman Catholic Primary School, Thornbury took place on Friday, October 24th, 1969. The blessing was performed by the Rt. Rev. Joseph E. Rudderham, Bishop of Clifton, who also gave the address. Introductory remarks were given by the Rev. Father Edmund Lanning, chairman of the managers and addresses were also given by Lt. Col. S. R. M. Jenkins, Chairman of the Gloucestershire Education Committee and by the Headmaster, Mr. J. G. Darwell.